At certain times of the year my schedule is completely dictated by the life cycle of plants. Plants. In spring it is the wildflowers in the Southwest. Come summer, it’s the wildflowers of the Colorado Rockies. In autumn – I chase fall colors. That’s probably the toughest season because the leaves are most fragile, early snowstorms can blow in, windstorms kick up and strip the aspens. Wildfire season can turn our lovely Colorado air into something reminiscent of California’s Inland Empire. The autumn shoot is fast approaching and I’m making my plans which is to say, I’m leaving the next several weeks wide open because you have to be ready to go when the leaves say so. I have that luxury in Colorado. But sometimes you just hedge your bets and plan a more distant trip based on the maximum likelihood that the leaves will have something good to show while you’re there. You buy your plane tickets and tell yourself that even if the colors aren’t spectacular, it doesn’t matter… because you’re in Yosemite. I’ve learned over the years as a nature photographer and a general lover of the outdoors that Nature is completely out of your control. That doesn’t mean you shouldn’t be prepared though. Arming yourself with good information can be the difference between a successful shoot and coming home with mediocre snaps. So when I was in Yosemite last February to shoot Horsetail Fall during that magical, but fleeting window when the setting sun illuminates the trickle of water coming down from El Capitan, I had some of the best information available to me. 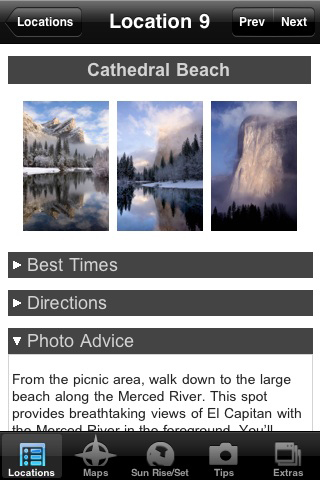 Michael Frye, a well-known Yosemite photographer of 25 years and my mentor, had asked me to beta test The Photographer’s Guide to Yosemite app on my iPhone. I stood in the snow with a dozen other photographers, waiting to see if the clearing storm would allow the sun to hit the falls. There were at least a hundred photogs milling about between the parking lot and other spots nearby. Some people had no idea where to fix their lens – because it’s hard to know unless you’ve seen it before. I pulled up the app on the iPhone and showed them Michael’s gorgeous capture so they could puzzle out where to train their eyes. Even though I was just beta testing, it was so incredibly handy to have. Alas, the setting sun hinted, but never spilled out enough for the shot. All of the other days I was there, we were socked in with clouds and snow. The app is essentially Michael’s book and then some! 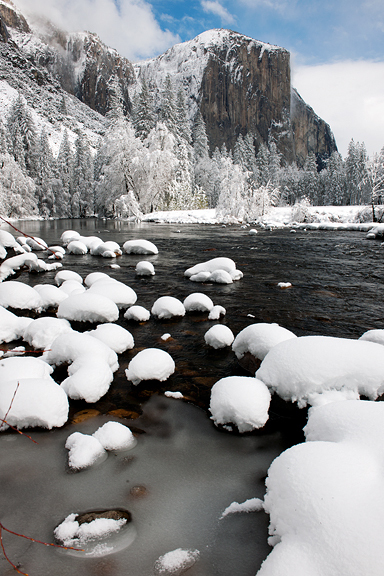 It guides photographers through Yosemite to the numerous attractions throughout the national park. There are detailed descriptions of locations, how to get there, where to go for the best views, the best times of year and day to shoot, several of Michael’s beautiful photographs, plus relevant photography advice from a master. 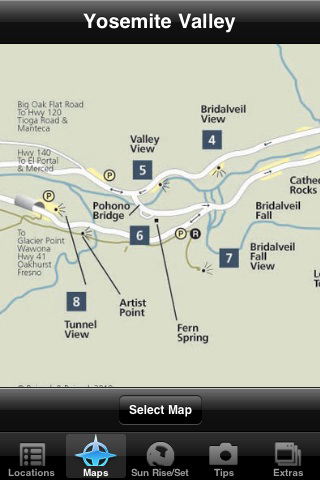 If you’re not completely familiar with the park, no worries – there are nice maps provided too. I’m all about the maps. Or if you want to know what your best bets are based on your visit, you can filter your search by entering the time of year and time of day. It helped me plan the logistics of my trip such that I wasn’t wasting precious time driving from one side of the valley to the other. 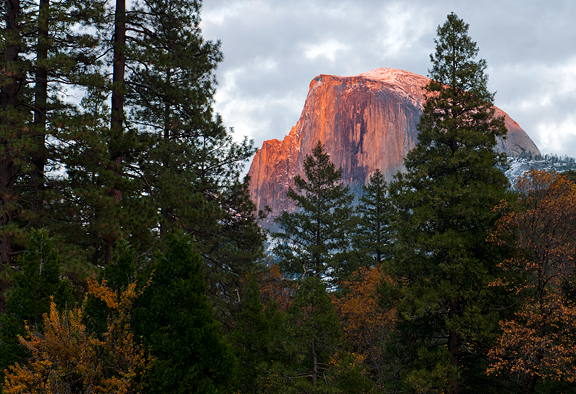 The good news is that Michael’s Yosemite App is out of beta and available for purchase! You can purchase it here on iTunes. I think anyone visiting Yosemite might want this app on their iPhone. Even if you aren’t planning to make any photos, the guide will put you in the right place at the right time to experience the grandeur and the majesty of Yosemite at her best. Congratulations on the release, Michael! Read Michael’s post on the release. As is typical of where I live (in the mountains), we have snow in the forecast for these last days of summer. We had snow on the first day of summer too. This makes for all kinds of happy over here at the House of Butter. Cooler weather means 1) getting my ski on and 2) getting my cooking mojo back. It’s back! I first had this fantastic salad in Seattle at Delancey last spring. It was surprisingly good. I really should never doubt the magic of cabbage. I love cabbage. I was with Shauna, Danny, and Lu. Danny and I tasted the salad and looked at one another as we analyzed it. Danny said it was pretty straightforward. Of course, Danny is a chef. I went home, tried to replicate it and my salad was woefully NOT DELANCEY’S SALAD. And then the other day I got a hankering for the salad again and asked Brandon if I could have the recipe because I’m such a loser that I couldn’t figure it out myself. Brandon – the guy who runs Delancey – is a gem of a fellow and a great cook. He sent me his instructions. When I asked if it was alright to post it, he said sure! Brandon is swell. My problem was that I couldn’t recall what was in the dressing. Turns out it’s a modified Caesar dressing. No anchovies, no eggs. More Parmesan and add chopped preserved lemon. While the original salad was served with luscious chunks of fried pork belly, I found some prosciutto ends at Whole Foods the other day and opted to pan-fry those to add to the salad instead. If you can’t find ends, quickly frying thin strips of prosciutto would be fine too, although they’d lend a completely different texture to the salad. If you decide not to add the preserved lemon or cured meat (like prosciutto or bacon) to the salad, then add a little more salt to taste seeing as both of those ingredients add salt to the dish. Mix the mashed garlic and salt paste, pepper, Worcestershire, lemon juice, and Dijon mustard together. 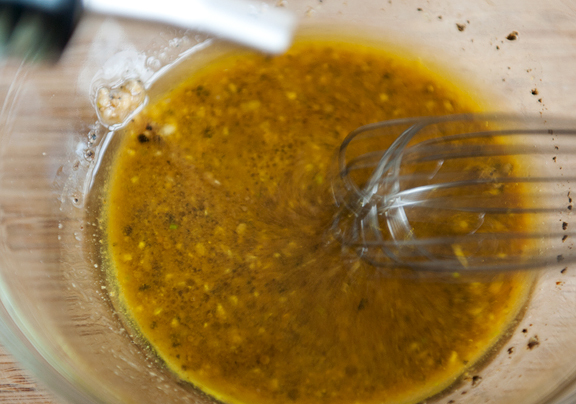 Pour the olive oil in a thin drizzle into the mix while whisking to emulsify. 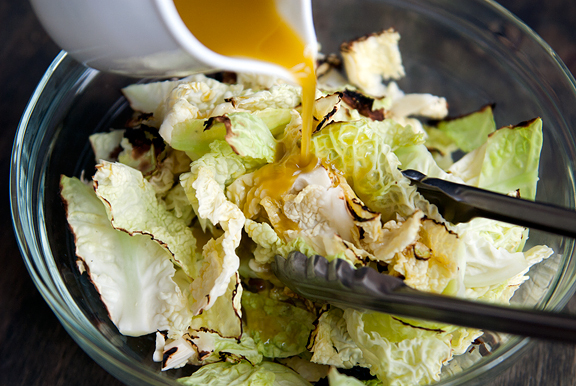 I like to toss the cabbage in the dressing first so that it gets a good and even coating. 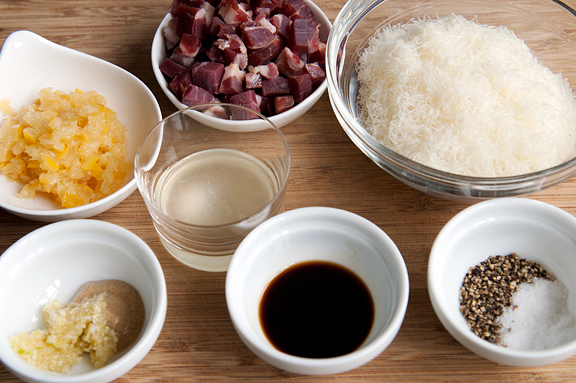 Then I add the rest of the ingredients: the grated Parmesan, the chopped preserved lemon, and the fried prosciutto cubes. If I mix them all up and then add the dressing, I get dressing soaking into the clumps of grated cheese which is a bit much for me. Wow, what an improvement over my first attempt! It’s a hearty and satisfying salad on its own – salty, tangy, earthy, barely bitter, a lovely dish. Definitely a repeat for us as we enter the shorter daylight months and something I could see myself serving dinner guests. It is THAT good. Thank you, Brandon! 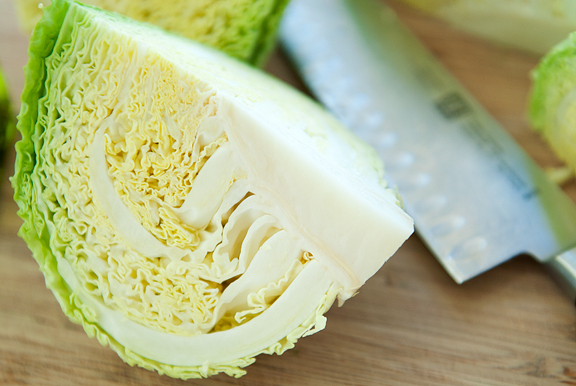 Trim the outer leaves from the cabbage head. Quarter the cabbage along the stem axis (i.e. the quarters should be symmetrical). Grill on high heat until the edges are charred. Flip the quarters to char the other side. It took me about 5 minutes per side, so a total of 10 minutes. Remove from grill and roughly chop the quarters into quarters again. Discard the cores and place the leaves in a large bowl. 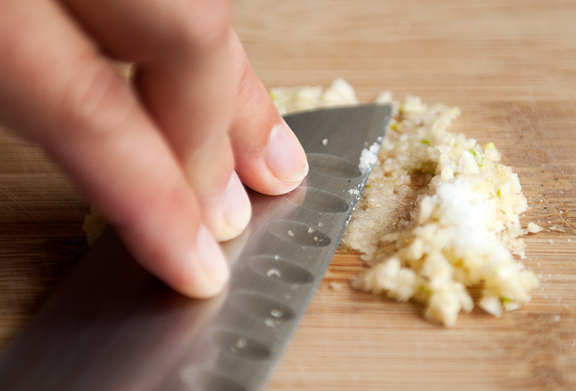 Mash the salt and the minced garlic together to make a paste. 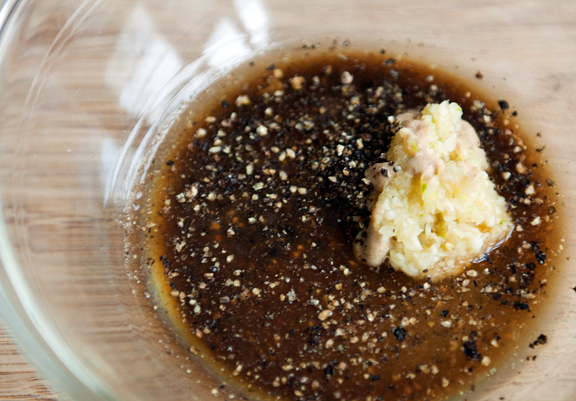 Place the paste in a small bowl along with the pepper, lemon juice, Worcestershire sauce, and Dijon mustard. Mix together into a sauce. Slowly drizzle the olive oil into the bowl while whisking it into the sauce. 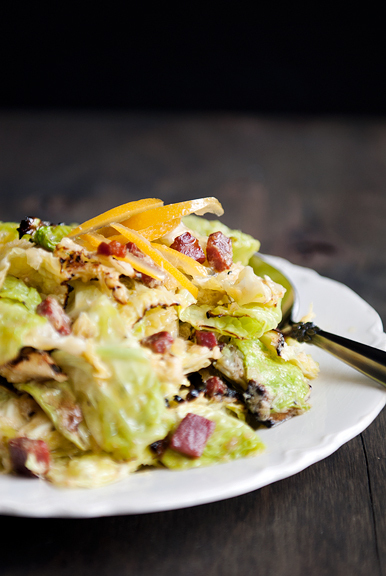 If you choose to serve this salad with meat: dice the prosciutto into 1/4-inch to 1/2-inch cubes. (If you use pork belly, you probably want to cut it into large chunks.) 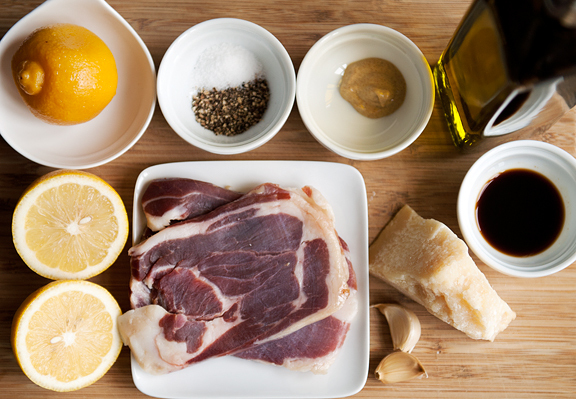 Cook the prosciutto in a skillet or sauté pan on high flame until the pieces begin to crisp and darken. (For the pork belly, I’m guessing you do the same). Pour the dressing over the cabbage leaves and toss to coat. 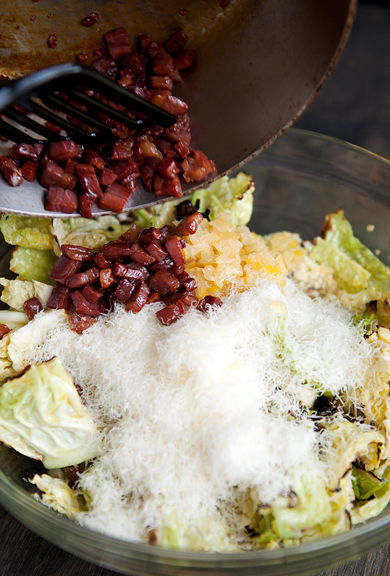 Add the parmesan, preserved lemon, and cooked prosciutto to the cabbage. Toss together and serve. Serves 4-6. Oh….this recipe looks like a winner….I will make it for sure…Thanks Jen. I am literally salivating all over the keyboard! That looks so amazing! mmmm. Thank you, and thanks to Chef Danny, too! Now, I must render myself useless until I try this salad. You live in, and have access to, such gorgeous nature! That salad is pretty swell too…if only I had a grill, or an outdoors! I guess we will totally lose something if I do this on a grill pan on the hob huh? This recipe sounds great! Thanks for posting it! 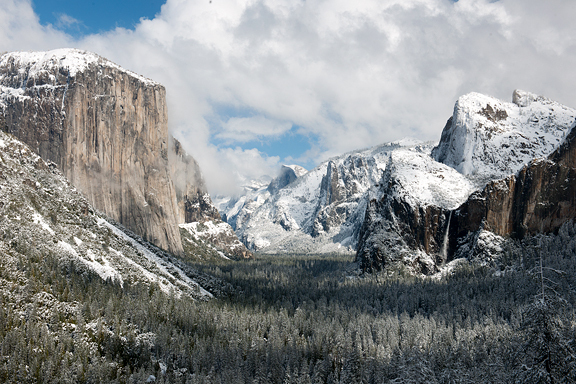 Michael’s app would be so handy for not only photogs, but also for those Yosemite junkies, like my niece, who may snap a few photos here and there but love visit the park again and again. What a great tool for those who may just want to experience the beauty of the park at any given time of day. Cool! Wow, that looks like a really neat app! And a delicious salad- can’t wait to try (sans meat for the vegetarian). Maybe some nuts for some crunch instead? I’ll have to experiment! This is the kind of thing that I normally don’t think I would order or be drawn to, but your photos and description make this a must-try for me. Love it! It’s such a breath of fresh air every time I read your site. So glad you do this and keep it going with all that you do and all that you have going on in your life. Thanks for the idea, and the beautiful post. That is a beautiful and elegant salad! I love the app. It is a fabulous idea. My husband and I used to have year passes to Yellowstone and Tetons when we lived up there. Sometimes you need help finding those little gems hidden in the parks. And you are right, autumn in the highlands can be tricky. 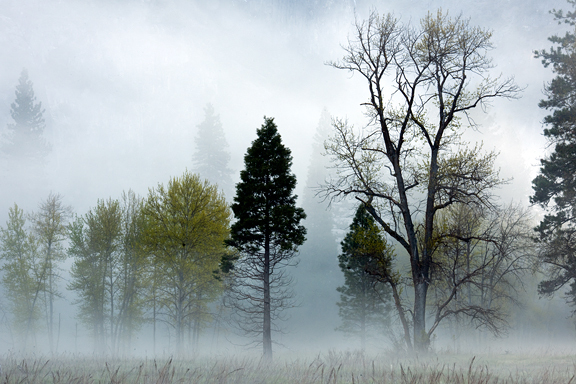 In Idaho, we would have an average 2-3 weeks of fall color before the snow forced the trees to drop their leaves. Your website is always fresh and beautiful to look at. 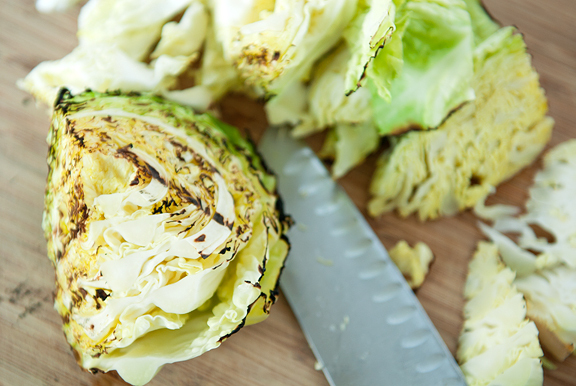 This cabbage salad sounds really tasty and your pictures of it are stellar! I’m wondering if you have any sort of opinion or advice about local and organic food. The differences between them, which you prefer and why. I’m about to join a CSA but it is not certified organic (however pretty much all of its farming practices are organic style and none of the seeds are GMO). Thanks for writing such a fun and inspiring blog! Just to let you know… I made it! Bing Chou – totally totally love it. vanillasugarblog – I swear by it! 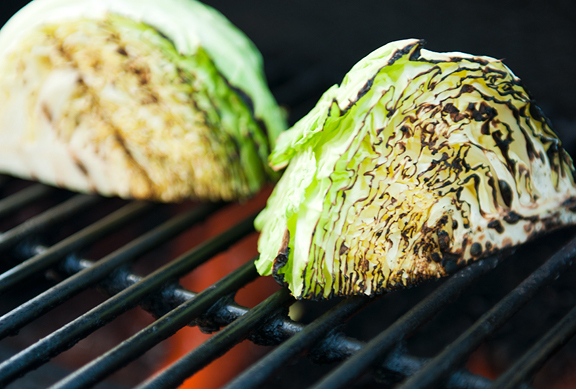 SallyBR – I’ve heard grilled lettuce is good, but I’m guessing the grilled cabbage has a nicer crunch/texture to it. I hope you like it! Tiffany – it so is! Margie – you’re welcome – hope you try it soon. Nan – I completely agree. 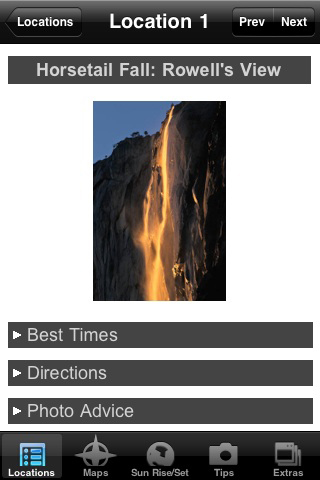 His app is wonderful and soooo packed with great information for anyone interested in Yosemite. Melissa – the recipe is really flexible, so do whatever you like. I love it. 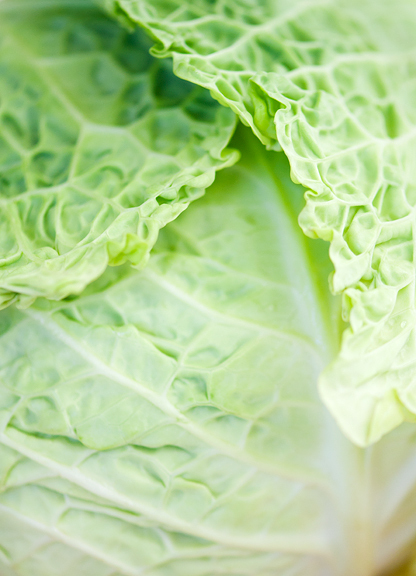 Annie – I’m partial to cabbage, but this salad is off the hook. Melissa @ Baking For The Boys – we get about 3 weeks of color if we’re lucky. It all depends on the timing of the colors, the weather, winds, snow, etc. Shosh – Well, I do try to buy organic when possible, but if it’s local from a farm I trust, then that will trump an organic shipped from far away. CSAs are GREAT and if I didn’t travel so darn much and have such a confined cooking menu (because I shoot a lot of recipes when I’m not on travel) then I’d totally do one too. I hope you enjoy it! Where oh where did you find preserved lemon? Sorry to keep commenting, and I promise to stop here… but this was a revelation kind of a salad. awesome salad. gosh, I cannot get over it. Awesome. This makes me miss Seattle and fall simultaneously! I can’t wait to try it. wow what a gorgeous and unusual salad!!! Thanks for sharing this recipe! With a head of cabbage the size of a bowling ball this week from my csa, I stumbled upon this just in time! Really great taste, I agree with others that I like the crunch the grilled cabbage vs grilled lettuce. The dressing is killer, made extra to use on other salads!